Writing in this book is okay! When I was asked if I wanted to review a Bible journaling kit, I knew I needed to say yes – and not so much for myself as my daughter, who is into all things involving pencils, pens, paper, words, crafts, and stickers. Of course, thankfully, she’s also into the Bible. I like the pen because it doesn’t go through the pages. I also like the colored twist pencils because say you have words like “darkness” and “light,” then you can use different colors to make them stand out. The stickers can label things for you. Like in the story of Nicodemus, you can use the sticker that says “fresh start” because he was born again. I like the sticker labels because they can mark special pages and you won’t have to go looking through the entire Bible for your favorite passages. The case can fit on most Bibles and it even has one of my favorite verses (Phil. 4:8) on it. I like the idea of a journaling Bible because it’s like a notebook in the Bible. Then when you are reading something you can see your notes and reread them to have answers. This kit helps with that. Cate also wanted to make sure I told you the kit doesn’t come with an actual journaling Bible, but I did recently buy her this one. And this kit works well with it! Create a work of art on the pages of your favorite Bible as you draw, color, or journal your thoughts, dreams, and prayers. Highlight your favorite verses or the encouragements that speak to your heart with pencils, stickers, and tabs. Kit includes four sheets of word stickers, four sheets of alphabet stickers, 24 tab stickers, eight colored pencil twists, a journaling pen, a pouch with adjustable strap to fit Bibles of all sizes, and one ruled page protector mat with tracing lines. 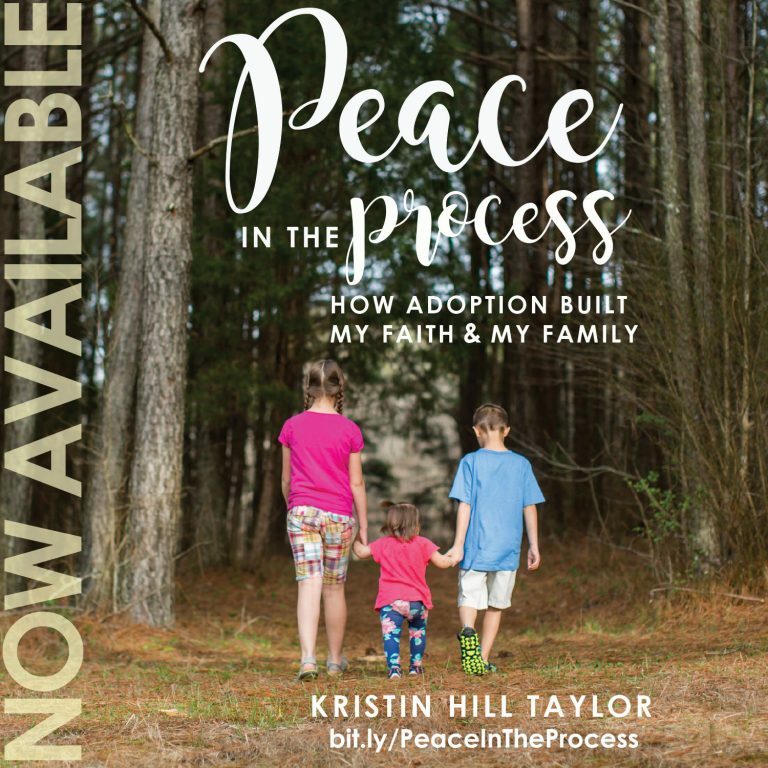 You can buy this kit at Amazon as well as Barnes & Noble, Books-A-Million, and Christian Book Distributors. And I have a kit to give one you! This giveaway is open to U.S. residents only through Friday, Dec. 2. Bonus! 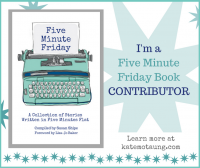 Worthy Publishing Company has an additional giveaway happening that you’re invited to enter. When you go to its page, you’ll also find some coloring sheets you can download. 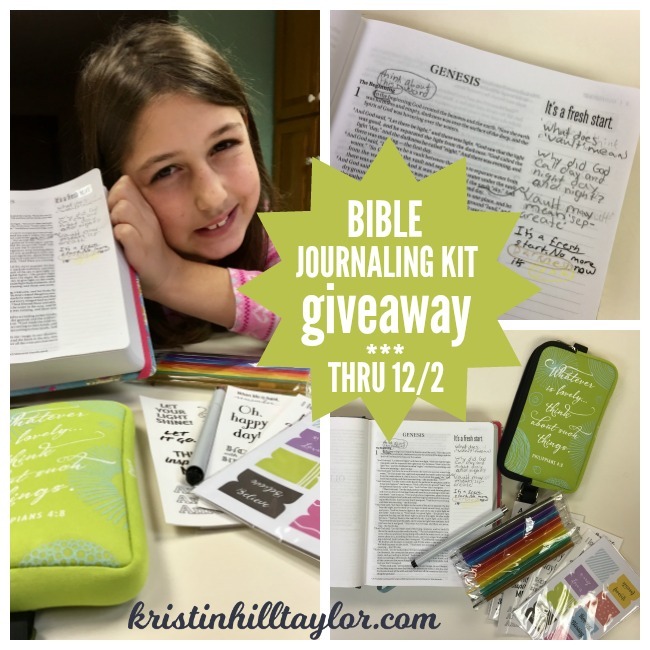 FlyBy Promotions/Propeller Consulting provided me (well, you know, really, Cate …) this Bible journaling kit in exchange for a review and will send the giveaway winner another kit! 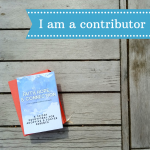 These opinions are ours and this post contains Amazon affiliate links, which help support this blog but don’t change any prices for you. If you have won a prize from FlyBy/Propeller in the last 30 days or have won this same book from another blog, you are not eligible to win. Winner is subject to eligibility verification. I do write in my Bible, underline, put stars by certain verses, etc. I quit highlighting long ago because it would always bleed through. I use the Bible on my phone so often now, but I have a Bible with margins, and I love writing notes & thoughts in there. I really should get back to that. I found some really great pens that are erasable AND don’t bleed. Win! Great job, Cate! I love that you’re enjoying reading your bible and choosing what is special to you. Thanks for sharing with us today! I love her review and she has a great favorite verse! I usually use the app these days so I have lots of differently colored highlights but no doodles. I’d love to get into Bible journaling though! I use an app so much more too, but I do love my journaling Bible. I don’t get too creative, but I do like having room to write notes and thoughts. I JUST ordered Liz a big girl bible yesterday for Christmas. This would be perfect to go along with it! Thanks, Cate! !